Air Compressor Market size will likely surpass USD 40 billion by 2024; according to a new research report by Global Market Insights, Inc. Rising industrial development in emerging nations will augment the air compressor market due to their widespread usage in numerous end-user sectors such as oil & gas, food & beverages, manufacturing, electronics and others. Asia Pacific is the manufacturing hub of the world due to favorable policies implied by many countries to attract foreign investments. The region is among the highest contributors in global industrial output as major automotive and machinery manufacturing companies have their production units here. This will provide an up thrust to overall air compressor market in near future. Rising demand for highly efficient and superior quality products in the industrial sector is propelling the air compressor market growth. Stringent environmental regulations related to less noise generation, energy efficient and low gas emitting air compressors are gaining popularity in most of the industries and this will further boost the entire market demand by 2024. Food contamination caused by many oil-filled machines is a major concern in the food & beverage industry. With implementation of industry norms related to food & beverage processing the demand for oil free air compressor is expected to increase in near future. Air compressors are also used on rental basis in order to utilize latest technology upgradations. The growing trend in this field may hinder the air compressor market growth and can result in lowering of the product sales. On the basis of product, air compressor market is bifurcated into portable and stationary. With a substantial share, portable segment is expected to growth with more than 3.5% CAGR by the end of the forecast timeframe. Rotary air compressor will exceed USD 15 billion by 2024 and hold majority market share in air compressor market on the basis of technology. The product has applications in various industries such as metallurgy and mining, papermaking and printing, medicine and health, household appliance, etc. Oil free air compressors demand will increase in near future due to significant usage in healthcare and food & beverage industries as it helps to lower the contamination level in final products. Also, the product has extensive application in medical research and semiconductor manufacturing. Increasing demand for white goods in emerging economies due to upgradation in personal living standards will further boost the home appliances segment in overall air compressor market. The segment is expected to capture over 20% of the revenue share in future due to its cumulative usage in air conditioners, refrigeration systems and some other appliances. 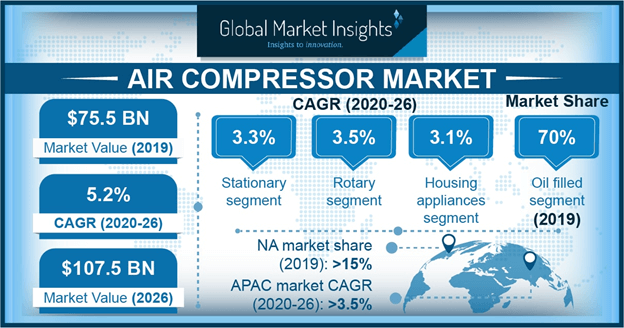 Europe has well-established manufacturing, electronics and home appliance industries and with increasing investments in these sectors the air compressor market is expected to grow at a substantial rate. Increasing oil & gas exploration and construction activities in Latin America and Middle East will further catapult the demand for oil injected air compressors in forecast time period. Some of the prominent players in the air compressor market include Kaeser Kompressoren, Atlas Copco, Ingersoll-Rand, Vanair, Sullivan-Palatek, VMAC Company, Hitachi Industrial Equipment Systems, Belaire Compressors, AireTex Compressors, Ciasons Industrial, Zen Air, Quincy Compressor to name a few.